The Second Avenue Subway reduces overcrowding and delays on the Lexington Avenue line, improving travel for both city and suburban commuters, and provides better access to mass transit for residents of the far East Side of Manhattan. The line is being built in phases; the first phase of the Second Avenue Subway provides service from 96th St. to 63rd St. as an extension of the train. 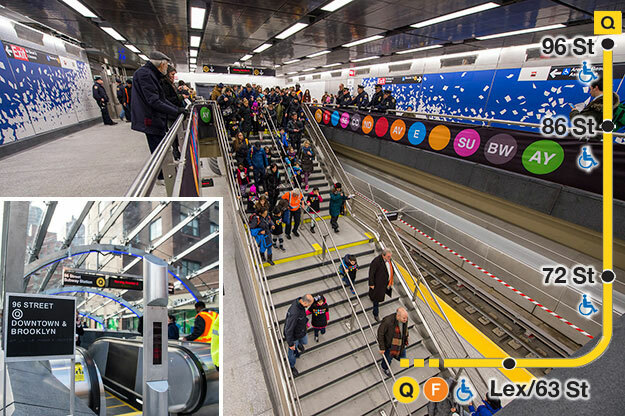 Phase 1 extends the train to provide an upgraded and modernized Lexington Avenue-63rd Street station and new stations at 96th Street (shown above), 86th Street and 72nd Street. New York City’s newly expanded subway system now has 472 stations—more than any other underground system in the world—to serve more riders with enhanced service. 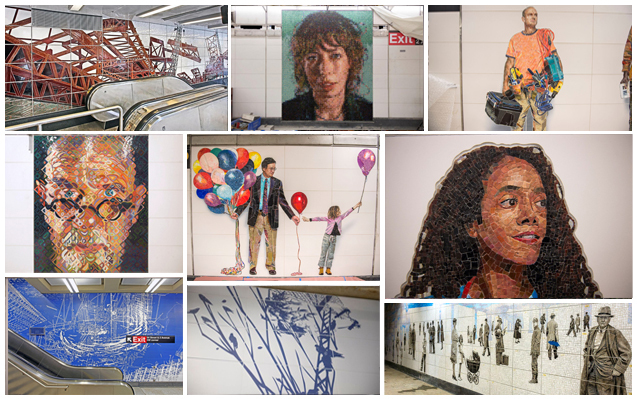 Commissioned by MTA Arts & Design, the Second Avenue Subway’s Phase 1 station art collectively comprises the most expansive permanent public art installation in New York history. These art installations represent the vibrance and cultural diversity of New York—a city continually on the move. Jean Shin’s installation, Elevated uses archival photographs of the 2nd and 3rd Avenue elevated trains to create compositions in ceramic tile, glass mosaic, and laminated glass. 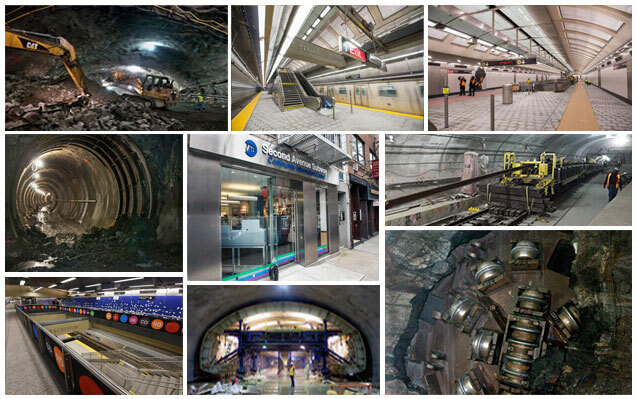 The imagery is manipulated and re-configured and each station level provides a unique focus, palette and material. At the 3rd Avenue escalator, the view is filled with ceramic tile depicting construction beams and the cranes that dismantled the El in the 1940s. At the 3rd Avenue mezzanine, a mosaic reveals the sky where the train had previously been present, and features images of people from the era in this neighborhood transformation. The platform level features semitransparent and reflective materials showing vintage scenes of the neighborhood, while enabling contemporary viewers to see themselves in the cityscape of the past. Perfect Strangers by Vik Muniz features more than three dozen characters created in mosaic and installed throughout the mezzanine and entrance areas, populating the station with colorful images of all types of New Yorkers. The main station entrance features a laminated glass canopy at street level depicting a flock of birds, bringing art and nature to the busy location. Within the expanse of the mezzanine concourse, the life size figures provide bursts of color and visual interest and an opportunity for new discovery with every trip through the station. Chuck Close in Subway Portraits has created twelve large-scale works that are based on the artist’s painstakingly detailed photo-based portrait paintings and prints. His various painting techniques have been interpreted in ten works as mosaic, and in two as ceramic tile. The artworks measure close to nine feet high and are placed on the walls at the station entrances and the mezzanine concourse. The people portrayed are cultural figures that have frequently been his subjects, including Philip Glass, Zhang Huan, Kara Walker, Alex Katz, Cecily Brown, Cindy Sherman, and Lou Reed, as well as two distinct self-portraits. Blueprint for a Landscape by Sarah Sze profoundly impacts the look of the station as her imagery is applied directly to nearly 4,300 unique porcelain wall tiles, spanning approximately 14,000 square feet. The designs feature familiar objects – sheets of paper, scaffolding, birds, trees, and foliage – caught up in a whirlwind velocity that picks up speed and intensity as the composition unfolds throughout the station with references to energy fields and wind patterns. Each entrance features a different shade of blue and a blueprint-style vector line design, a visual theme that is integrated with the architecture. For further information on MTA Arts & Design and its art, visit http://web.mta.info/mta/aft/. 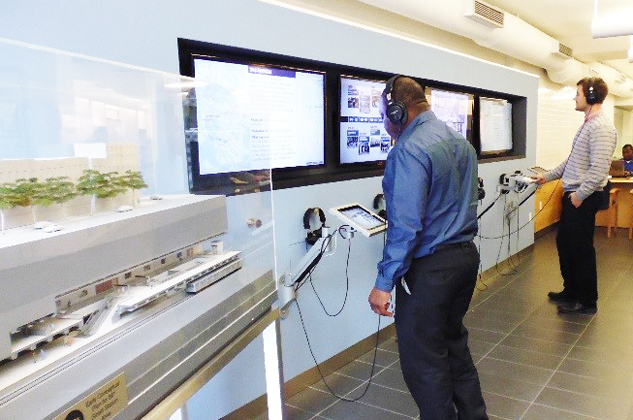 Since opening in July 2013, The Second Avenue Subway Phase 1 Community Information Center has welcomed more than 25,000 visitors, who among other activities, have explored the five interactive exhibits displayed there. For those who could not make the trip to the center, the first of the five exhibits, The History of the Second Avenue Subway: Transit More than 80 Years in the Making, can now be viewed online. The exhibit traces the history of the Second Avenue Subway from an idea in the 1920s through the planning and construction of Phase 1 and includes archival photos, videos, working documents, and news clippings. The exhibit highlights the many plans to build the line, including an effort in the 1970s that saw construction of tunnels in both lower Manhattan and East Harlem.